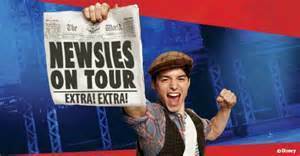 Coming on Tuesday, November 17, 2015, to the Broward Center for the Performing Arts is the hit Broadway show "DISNEY'S NEWSIES" and I'll be there! It is the kick-off show of the 2015-2016 Broadway Across America series of touring shows coming to Fort Lauderdale. It will be here until November 29! It won the 2012 Tony awards for Best Score written by Alan Menkin and Jack Feldman plus for the choreography by Christopher Gattelli which explodes on stage. The book was witten by one of my favorite theatre talents Harvey Fierstein and the production is directed by Jeff Calhoun. It is the story of a group of newspaper selling underdogs who become heroes when they fight some of the most powerful men in New York. Aside from being a rousing tale about fighting for what's right it also has a tender love story. I'll be there opening night so look for my review! Meanwhile here is a taste of the show first in a slideshow of pictures by photographer Deen van Meer and then a number from the show. SLOW BURN THEATRE PRESENTS "HEATHERS THE MUSICAL"